I wanted to use a title stating “the demand for mass transit to the east of Metro Manila” but the word “demand” for me seemed a bit technical (I associated it with the supply and demand concepts for transport.) and would need some numbers to support it. So I settled for the word “need” instead of “demand” so I could be flexible (i.e., more qualitative) with the way I wrote this article. “Need” is a more pedestrian term that can easily be understood and imagined, and there is no lack for images of this need for more efficient and higher capacity modes along the main corridors to the east of Metro Manila. The main corridors are Ortigas Avenue and Marcos Highway, which have the highest road capacities among other roads (i.e., higher capacities than A. Bonifacio Avenue in Marikina, the Batasan-San Mateo Road, or C-6/Highway 2000). These are also the corridors along which most public transport services may be found. Such connects the eastern towns (e.g., Cainta, Taytay, Antipolo, etc.) to the transport hubs of Cubao and Crossing, which are major transfer points for many people taking public transport. Of course, there are UV Express services from these eastern towns that go directly to CBDs like Makati and Ortigas. You can observe the crowds at Katipunan and Santolan Stations of the LRT Line 2 as well as the people waiting for their ride home along Marcos Highway. I have observed that there are also lots of people along Ortigas Avenue from Tikling Junction to C-5 who religiously and patiently wait for their rides to school, office or home. This happens everyday and this regularity seems to be a never-ending sacrifice of time and patience. These people do not have much of a choice except taking whatever public transport is available to them. Many probably can afford to have a car or already have a vehicle in their household. Unfortunately, that vehicle is not usually enough for their commuting needs and so they are captive users of an inefficient public transport system (there are some who question if what we have can really be called a system). 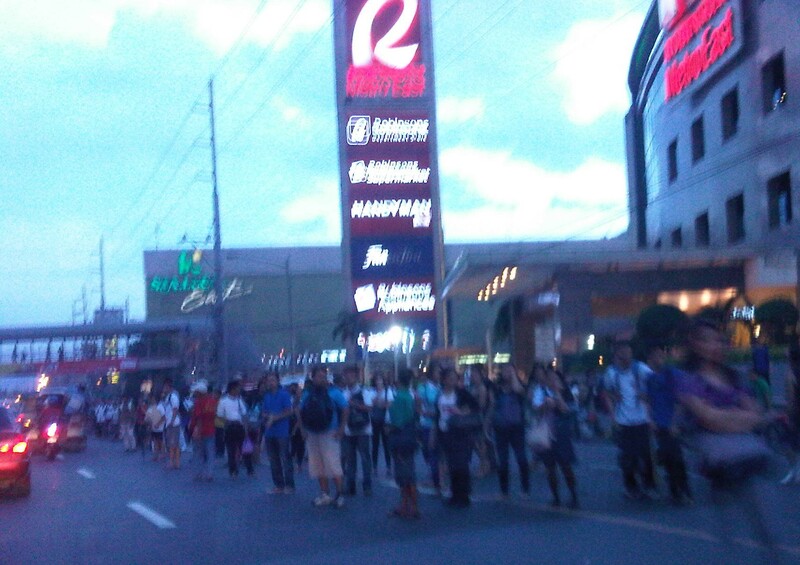 People waiting for a ride in front of Robinsons Metro East along Marcos Highway in Pasig City – these have occupied 3 lanes of the highway as they position themselves for the next available jeepney. There is a UV Express terminal at the mall and another at the nearby Sta. Lucia mall but these are not for the destinations these people are going to. News that the LRT Line 2 Extension from Santolan to Masinag would finally be constructed was initially met with speculation. Such news have been circulating for so many years but no actual work could be seen along Marcos Highway to convince people that the project was underway. Now, that the soil test samplings have been completed, people are anxious about the actual construction of the extension. I think this is a project long overdue and the question that needs to be answered is if the line needs to be extended further, perhaps until Cogeo. I believe there is a tremendous market for this mass transit system along this corridor where a lot of residential subdivisions and relocation sites have sprouted over the years. The DPWH recognised this as a high capacity corridor and is already widening the road from Masinag to Cogeo. Hopefully, the Ortigas Ave.-Manila East Road corridor can also have its own mass transit line. The regular bus services along this corridor is no longer sufficient and operations are not so efficient despite what appears as competition among 2 bus lines. There had been a Bus Rapid Transit (BRT) Line proposed for this corridor but there seems to be no progress towards the realisation of that project. Whichever of rail or BRT would be the option for the corridor though, it doesn’t take a genius or too many consultants to determine the need for a good mass transit line along this corridor. When that will be is a question with an answer that is still up in the air. Perhaps the local governments of Rizal, especially the province, should push for such transit systems. The governor and mayors should champion such systems that will definitely benefit their constituents and translate into real revenues for their LGUs from the certain business that will come along these corridors. By d0ctrine in Behavior, Governance, Public Transport, Transport Planning on June 21, 2014 .